tl;dr - I baked a cake that's safe for dogs to eat. Here's the recipe. 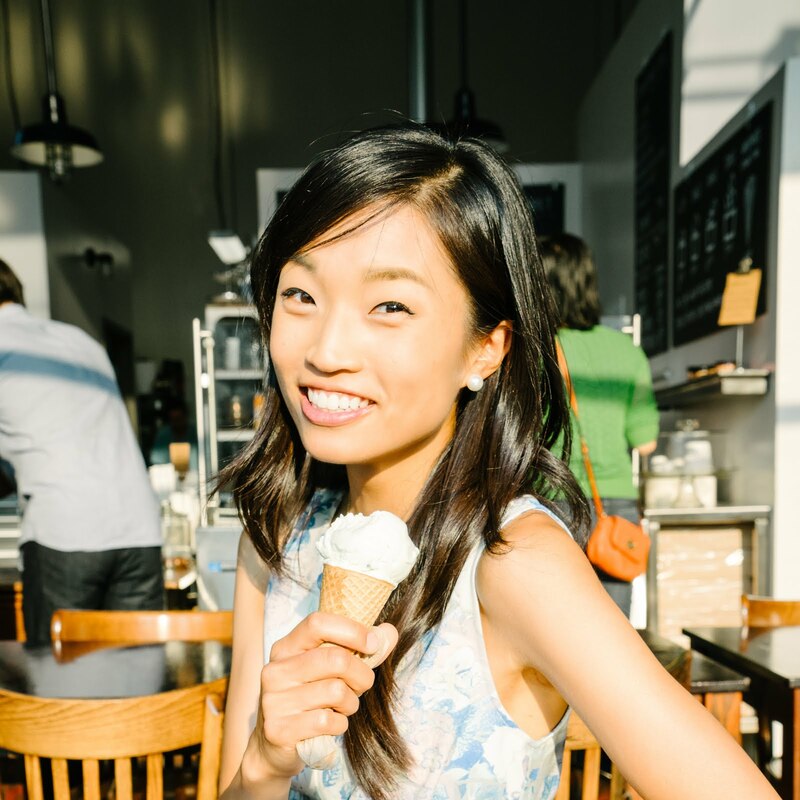 This post is long overdue, as Buddy left the SF Bay Area for southern California over a year ago. 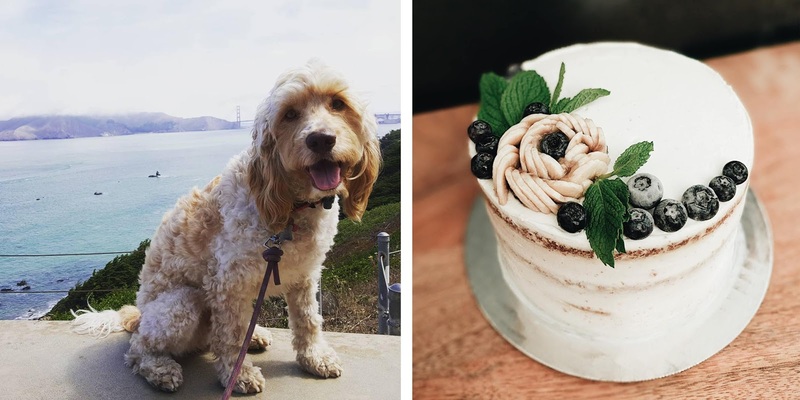 Buddy's parents Kristine and Morten (y'all might remember the earl grey salty caramel cheesecake I made for their wedding last year) kindly invited me to their going away party at Crissy Field, so I took this opportunity to explore new territory in the kitchen: cake for dogs. Until this party, I'd never baked for any species other than human. Some concerted Googling led me to discover many categories of human-food that are off-limits to dogs (the only one I'd known about beforehand was chocolate). Thanks, Dog Whisperer! Given these constraints, I modified a dog cake recipe and a yogurt dog frosting recipe. I topped it off with some dog-safe cake decor: frozen blueberries (I like to buy them fresh and freeze them myself to achieve that "frosted blueberry" look that's all over alphafoodie's Instagram page), a banana ripe enough to shape slices into a rose, and fresh mint leaves. Humans can eat this cake, too: The cake-for-human s I made for this party was a structural disaster. Fortunately, I made cupcakes-for-humans as a backup. But it was nice knowing that if the cupcakes somehow went kaput, we could eat the cake for dogs. I had a few bites of the dog cake as I was making it - the taste was not amazing but passable. The yogurt-tapioca frosting is easy to use: I've never been one who's had an easy time getting the frosted sides of her cake smooth - it takes me at least 30 minutes of very concerted work with an offset spatula and warm water to get a cream cheese frosting or buttercream cake to look decent. But the yogurt/tapioca combo made the process of frosting this cake a breeze. 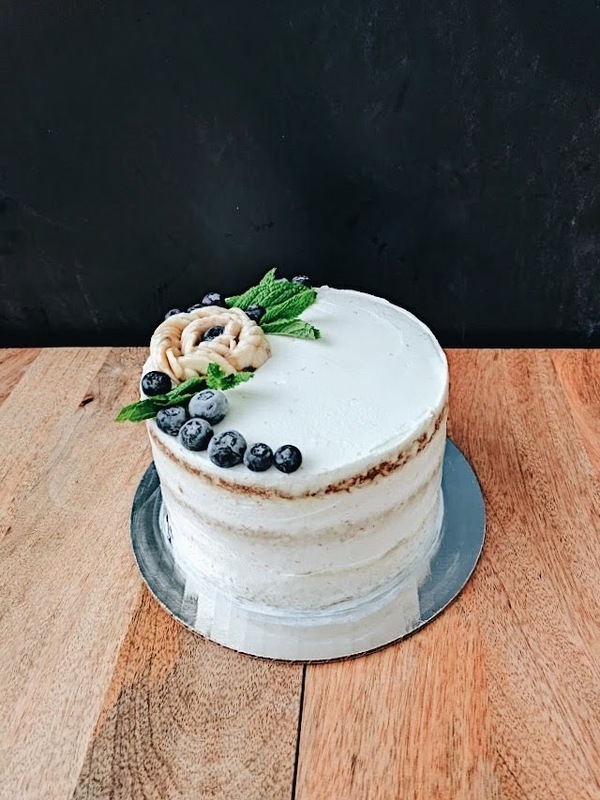 It was very quick to get a smooth top, sharp edges, and that almost-naked cake look so difficult to achieve with buttercream or cream cheese frosting. It's fun to watch dogs chase after and eat a cake: Presented here without comment. Preheat oven to 350 degrees F (175 degrees C). Grease two 6-inch cake pans with a vegetable-based oil and line them with parchment paper rounds. Combine the egg, peanut butter, oil, vanilla, and honey, if desired, in a large bowl; blend well. Stir in the carrots and mix thoroughly. Sift together the flour and baking soda and fold into the carrot mixture. Spoon cake batter into prepared pans. Place yogurt and tapioca starch in a small bowl and thoroughly combine. Mix in milk a teaspoon at a time until you achieve the consistency of frosting. Add a dab of the yogurt frosting to a cardboard cake round. Once the cakes are cooled, place one of them on the yogurt frosting dab to secure onto the cardboard cake round. Spoon some frosting on top of the cake. Add the other cake on top. Spoon the rest of the frosting on top of the second cake and frost the sides. Decorate the top with blueberries, mint, and banana slices. If feeling ambitious, turn the banana slices into a rose, similar to how you'd make an avocado rose.